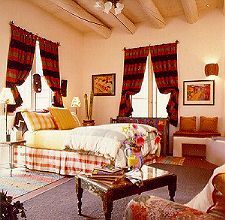 Just four blocks from the Plaza, this intimate and inviting Southwestern-styled B&B maintains its old world feeling while offering every modern convenience. Two delightful guest rooms, plus a two-room suite with full living room in the main house. Three rooms in the Courtyard Compound, all with private patios: A casita with private patio and very large, luxurious suites with fireplaces and private patios. Private baths, phones, designer linens, color cable TV's, robes, coffee makers and custom toiletries. Rates: $135 to $175. Hearty gourmet breakfast featuring fresh fruits and juices, changing daily Southwestern entrees and homemade muffins.Visa and Mastercard.